A dedicated Green Roof Research Facility was constructed in 2003 to evaluate green roof performance for stormwater source control and thermal efficiency. Located on the Great Northern Way campus, this sophisticated facility was situated in an urban industrial environment. A centralized date acquisition system collected information in real time ~125,000 pieces of data are collected every 24 hours. This research facility was decomissioned in the summer of 2014 after collecting eleven years of data. Data analysis in stormwater runoff, thermal performance and plant viability is near completion. The Centre was built with the help of over 200 students from BCITs polytechnic stream, including the Architectural and Building Engineering Technology program, Carpentry, Structural Drafting, Steel Fabrication, Electrical, Electronics, Sheet Metal, Plumbing, Millwork and Finishing. 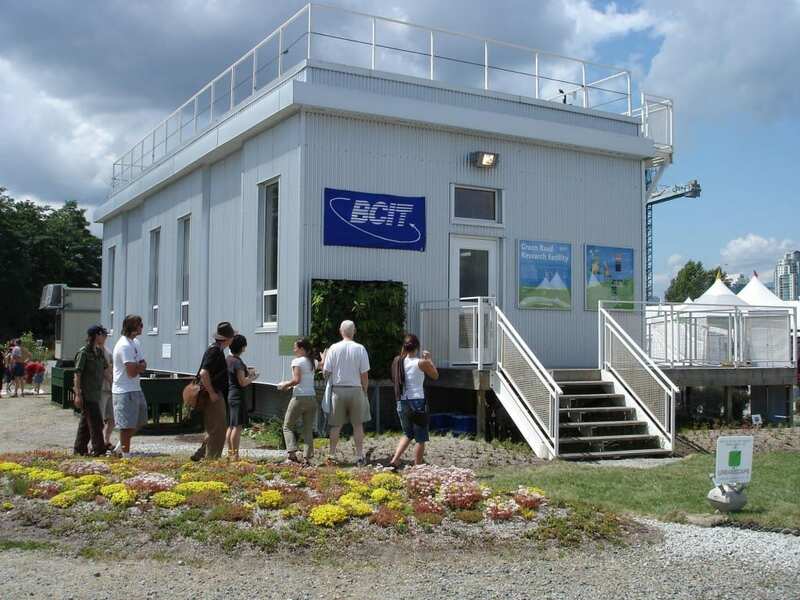 The BCIT Green Roof Research Facility is the most sophisticated facility of its kind. The Green Roof Research Facility is outfitted with a weather station which measures rainfall, temperature, relative humidity, wind speed and direction, and solar radiation. 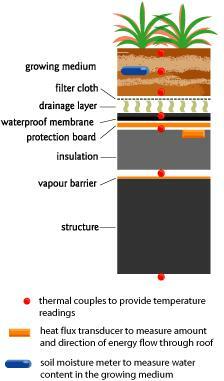 The three independent roof surfaces – one reference roof and two green roofs – each have their own weather poles to measure the same climatic parameters. 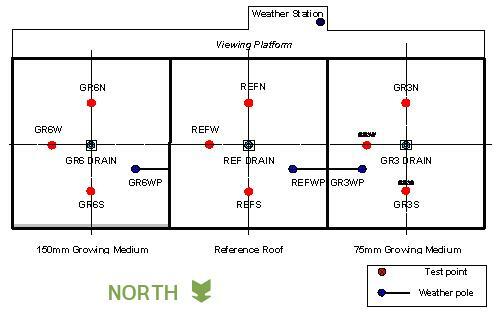 Roof plan showing locations of weather station, weather poles and thermal couples. The location of the Facility is ideal for research: there are no neighbouring buildings to create microclimatic variability, and the post-industrial landscape creates the desired hostile urban environment of asphalt and gravel.